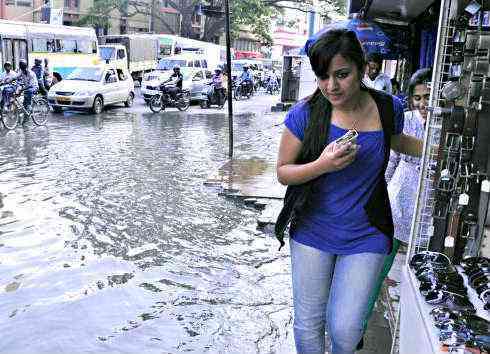 When Bengalore went to sleep on Monday night, the city had received 44.8mm of rain for August. When it woke up on Tuesday morning, that figure had risen by 128.7mm - the highest rainfall in a day since 1890, according to the Met department. It made up nearly 300% of the rain expected over the entire month, pouring down on the city from 11pm on Monday to 4am on Tuesday. The highest-ever rainfall recorded in the city in a day was on August 27, 1890, when Bengalore received 162.1mm of rain, the monthly ave for Sept August is 62.8 mm. According to the Karnataka State Disaster Monitoring Centre (KSDMC), that record was broken on Tuesday. It said the city received 184mm of rain since Monday night, the highest being recorded in Bilekahalli. The overnight rain flooded several parts of the city, submerging parking lots and entire road stretches, and snapped power in vast swathes since the early hours of Tuesday. The Yediyur lake breached a retaining wall, while foam from the Bellandur lake flowed to neighbouring localities. Over 40 rescue boats came out in ST Bed area of Koramangala, while the fire department was called to flush out water from apartments in HSR Layout, Koramangala, Jayanagar and Bannerghatta Road, among other areas. At least 26 trees were uprooted. Wildlife volunteers received panic calls as snakes entered homes in Rajarajeshwari Nagar, JP Nagar, Nagarabhavi, Thanisandra, Uttarahalli and Puttenahalli.